for Julie Hedlund’s short program The12 Days of Christmas. The videos are archived and enabled me to participate. One suggestion was to write this post on gratitude. THANKS, Julie. for TIME spent with family. It’s the real gift that keeps on giving, especially when I’m with any one of 10 grandchildren. The youngest begins pre-school. 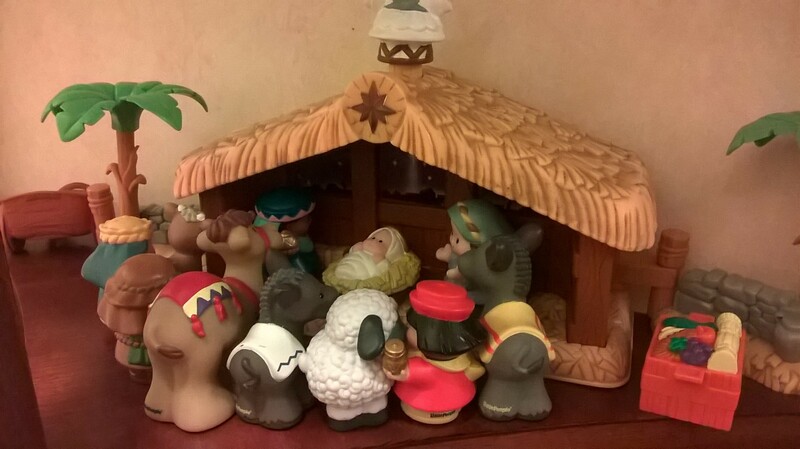 He has left his presence in my heart and home; thus, this arrangement of the manger scene on 2014 Christmas Eve. for overall good health, in spite of having to continue exercising one knee and reinstate my exercise habit of many years, after repairs this past year. for my writing habit that continues to prepare me and push me closer to my goal of publishing children’s books. for travels with spouse to California and Maine. for new friends and old friends who lift my spirits and who, in SCBWI and 12 x 12, critique my manuscripts. for a sharp physician who confirmed that I need less medication now. YAHOO! for money – the lack of it shall not, solely, determine my goals. for a habit that I developed while working under a leader and friend, Pat Easterling, who said to write my to-do list before I go to bed. When I awake, I’ll know what I have to do, even before I make the coffee. And, on these chilly days, I often think of my mother and grandmother who taught me to cook and clean. I am thankful for choices and opportunities they weren’t afforded. I’m thankful for my cozy home, favorite recipes, and my husband who love my cooking.